Plus new space-based cooperation and maritime drills. A Japan-U.S. defense links roundup. Both Japanese and U.S. officials are leaking key pieces of information regarding the expected update to their defense cooperation guidelines, which was set to be announced by the end of this year. After releasing an interim report two weeks ago to outline the progress both sides have made so far, on Tuesday the allies said they are currently negotiating a meeting of their defense chiefs sometime next month. U.S. Secretary of State Chuck Hagel and his Japanese counterpart Akinori Eto will seek to hold a sideline meeting during the ASEAN defense minister’s summit on November 18 and 19, where authorities announced the two will discuss accelerating the revision process. Aside from their cooperation guidelines, the two are likely to also reaffirm the controversial plan to move the U.S. Marine Corps’ Futenma Air Station to a its new location of Henoko on the island of Okinawa. Japan and the U.S. are expected to follow through with the relocation regardless of the outcome of the gubernatorial election on November 16, even though the Japanese government has repeatedly said it would make its position clear to the local population before doing so. While official government statements from both countries on Tuesday indicated that the process for updating the defense guidelines would be sped up, unofficial statements indicate that the process may be delayed until as late as next April. A senior U.S. official on condition of anonymity has said that additional time will be necessary in order to work out exactly how Japan’s Self-Defense Forces will be able to contribute to U.S. military action, especially in light of Japan’s new interpretation of its constitution’s collective self-defense clause. According to Kyodo News, the official said there would be “two-plus-two” talks between their defense and foreign ministers, at which point a final version of guidelines will be worked out. “We don’t need to put the whole thing in the (new) guidelines, but we need to have something about the activities of the SDF,” the source said Monday. Japanese sources hinted last month that a delay would be necessary in order to keep the ruling LDP’s coalition partner Komeito on board with the defense plans. Finally, on Tuesday Japan announced bilateral military exercises with the U.S. 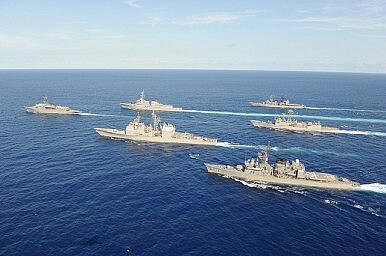 Dubbed “Keen Sword,” the exercises will be held from November 8 through 19 off the eastern coast of Kyushu Island. The drill, held every two years, is intended to “ensure smooth joint operations between the two countries’ militaries and bolster island defense capabilities.” According to Reuters, the exercise will include 37,700 Japanese personnel and roughly 10,000 U.S. soldiers. While the drills are held regularly, they are likely to draw greater attention as the situation between Japan and China over the disputed Senkaku/Diaoyu Islands has deteriorated over the past two years. Additionally, the operation could include expanded roles for the JSDF, as previous drills have this year, in light of the anticipated update to the defense guidelines.